learn more about this 12-15 year long commitment? disqualification. This means that silver is not an allowable color. 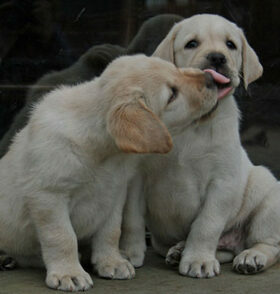 that are part of a true purebred Labrador's heritage - http://www.notosilverlabradors.com/. to register those puppies by falsely stating the true color of dilute puppies. How Much is That Puppy....Say What? What Makes A Devanley Puppy So Special? are raised in the main living area of our home from the day they are whelped to the day they go to their new approved family. They are exposed to every day family/household life and receive consistent daily human interaction/handling to ensure proper socialization. receive all necessary vet checks, puppy shots, and deworming. receive Early Neurological Stimulation between the ages of 3 and 16 days. This is the first stage in a program known as "Bio Sensor" and "Super Dog" used by the U.S. Military in their canine programs. The second stage is Socialization and this stage begins at 4 weeks of age and continues through 16 weeks of age. New families are given information on how to continue this stage as well as begin the third stage - Enrichment. Please click here for more information about this program by Dr. Carmen L. Battaglia here to learn more. Puppy Culture methods are incorporated in raising Devanley puppies. Please click here for more information about Jane Killion's program. are given special consideration when placed with their new families. Each puppy is different as well as each family is different - so the puppy's personality and temperament as well as the family's makeup and expectations are all considered when puppies are matched with their new families so a win-win situation is created for both the puppy and its new family. have parents that have had their health clearances completed and have participated in AKC events. Their human parents are active in the dog world and are active members of Lake Erie Labrador Retriever Club and Medina Kennel Club, and are members of the National Labrador Retriever Club. have a written hip and eye guarantee for 26 months. leave here at 9-10 weeks of age. Families receive an extensive Puppy Notebook - complete with thorough health & weight records, parental health clearances, pedigree, hip & eye guarantees, AKC registration information, microchip information, bill of sale, and a Devanley Puppy Instruction booklet. In addition, puppies leave here with a "litter & mom scented toy" and a 6 lb bag of puppy food and Nature's Farmacy Digestive Enhancer. receive lifelong support from Devanley Labradors. If you ever have a question or a need, please call or email us. are produced when, and only when, Devanley Labradors plan on keeping a puppy for themselves for their own future show plans. Puppies are never produced for just the purpose of having puppies. Devanley Labradors reserves the Right of First Refusal if, for any reason, during the lifetime of your Devanley puppy, you need to rehome your puppy/dog, Devanley Labradors will rehome your puppy/dog for you. This prevents any Devanley puppy from ending up in a rescue or shelter situation. If you are interested in a Devanley Labrador Puppy, please fill out the Puppy Buyer Questionnaire (click here).